Baltimore Md. – 3M Prestige Film was specified for the renovation of a government building to replace existing film. The selection of the film was based on the need for improved lighting conditions while reducing Solar Heat Gain. The 3M Prestige Film selected reduces Infrared Heat by 97% while allowing 50% visible light to pass through. 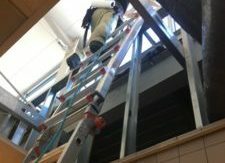 The installation of these 3M Prestige Films involved some difficult ladder work through ceilings and rafters. Fortunately, the crew at Xlnt Tint of Mid Atlantic is accustomed to difficult installations, and the results were outstanding! 3M Prestige Window Films are constructed using a patented design that virtually eliminates damaging UV rays and Infrared Heat from the Sun. These technologically advanced films are designed to reduce glare and improve the performance of all windows.